Pete, singer, and Noon, actress, are in love but don't often see each other due to busy schedule. Noon introduces to Pete her younger student sister. Noon also meets a doctor during a short stay in a hospital. Due to distance, their love fades and temptation is high. Will they stay together? 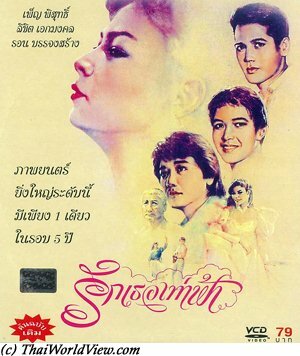 Khaem (เข้ม)(Amphol Lumpoon) is playing in an underground casino (บ่อนพนัน). He is a young man coming from a good family. His father has never time to take care about him as he is busy with his factory. The father is worried about his family name as Police often raids casinos but Khaem has no choice to find money (ไม่มีทางเลือก). The father is divorced. Khaem decides to go his own way and wishes to be a policeman. He has a good personality (บริสุทธิ์ทั้งใจทั้งกาย). Khaem is a new policeman (ผู้กองใหม่ ) sent in far South. He meets Toon (ตุ่น), who is a female teacher (ครู) in south of Thailand. Toon and Khaem know each other since childhood. Toon has come to far South of Thailand as she likes countryside life (ชีวิตบ้านนอก) despite harsh life (no electricity at night time, robbers). They were both sent to Pulakong (ปุลากง), which is a remote district in South of Thailand, where villagers are muslim and mainly speak Malaysian. Teacher Toon is helping the village to develop. She helps to resolve villagers problems. There is reminder that they are all Thai whatever the religion they follow. There are many robbers (โจร) and ruffians in the far south (คนร้ายไม่ชอบคนดี, สัตว์นรก). The teacher helps a robber Saliman but it turns bad. Hopefully Khaem can help on time. Saliman loves Noon also. He changes his behavior (เปลี่ยนตัวให้มีค่าสำหรับสังคม) but Toon sees him as a friend only. Khaem and Toon have love for each other but none dares to speak the first. A drama happens in the village. Toon's best Muslim friend suicides herself after an unwanted pregnancy with a Buddhist teacher. Shocked she decides to go back to Bangkok. Meanwhile Khaem is injured at the border. He is cured in Bangkok and a personal nurse is taking care of him. Believing there is no possible love with Khaem, Toon goes back to south of Thailand. Khaem follows her there and declared her love to her. This romance movie includes a few themes related to South of Thailand (different religion but same nation, help to local development, living in harmony), to people redemption (Saliman the robber can become a good man), to the family (parents to give time to their children). 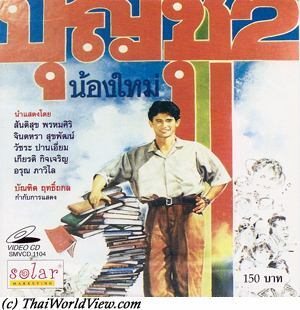 Thai movie ผีสองนาง was released in year 1989 and lasts 1h13mn. It was released under VCD format by Lepso company. 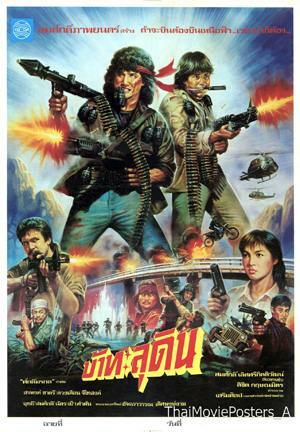 A VHS version was released in Hong Kong under the name of Heavenly Spell / 菩薩咒 / Heavenly Devil in year 1991. 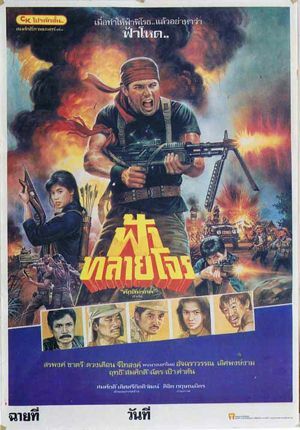 It was also released again in Thailand under the name of นิกายมนต์ดำนรก. Main actors and actresses are Bin Banleurit, Suchao Pongwilai, Paen Pleumsachai, วาสิฎฐี ศรีโรฟุ้ง, ศศิมาภรณ์ ไชยโกมล. 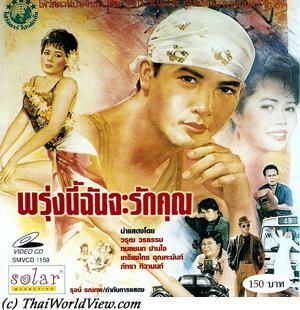 Thai movie ผีสองนาง is based on a real legend in Nong Khai province. Two sisters drowned in the Mekong river with a treasure chest while escaping Vientiane during the Thai looting in year 1828. They become ghosts protecting the treasure chest. They can metamorphose themselves into giant mystical snake or พยานาค. The shrine is located in a Thai Buddhist temple in Sri Chiang Mai. A convoy led by two noble Laotian ladies is transporting a treasure. They are attacked by Thai robbers. Seeing the beautiful ladies, the robbers wish to abuse them. A young Thai man interposes but he is outnumbered. They have to flee. Both ladies fall in the river. The young man is only able to rescue one lady. The other lady drowns. The treasure has fallen in the Mekong river also. Later on, a shrine is built on the river bank as homage to the drown lady. A local young girl, named Lamyai, refuses to give respect to the shrine. At night time, the spirit kidnaps Lamyai. Snakes prints are seen. Lamyai is the district officer’s (Paen Pleumsachai) daughter. He asks help from witchdoctor (หมอ) Chook (Bin Banleurit). Chook promises to help to recover his daughter. He dives in the river to find Lamyai. Chook fights and defeats a big snake (งูเจ้าแม่). Lamyai doesn't wake up but finally the snake spirit accepts to release Lamyai’s spirit to ease tensions in the village. The snake spirit changes its appearance to lie to old villagers to get unction (ยาทำแผล) to cure the injury caused by Chook at its neck. If the snake spirit gets cured, it will be danger (อาละวาด) for villagers again. Chook makes special ceremony (พิธี). 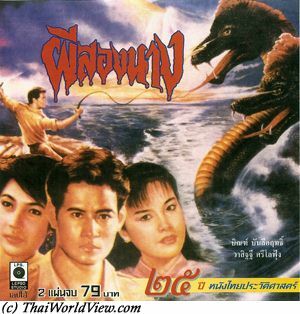 The snake spirit (พญานาค) hires two others black magic sorcerers to fight against him. Another witch doctor warns Chook (ของดีในตัว) that the snake spirit will try to hurt him again (ปล้ำ). 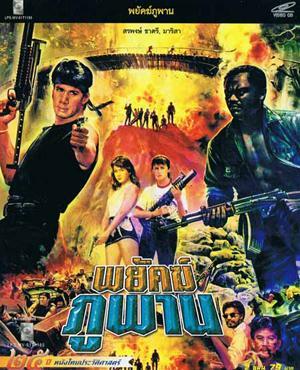 Chook has to face a Cambodian black magic sorcerer looking for troubles. Chook dives in the river and gets the treasure back. Suchao Pongwilai is pushed by the snake spirit to defeat Chook. Knowing that the snake spirit has no more treasure, Suchao decides to play his own game to defeat both Chook and the snake spirit. He even destroys the ghost shrine (ไม่มีที่พักอัศาย). Finally understanding that Chook uses white magic and not black magic like the cheating sorcerer Suchao, the snake spirit helps in order to defeat Suchao. The snake spirit forgives Chook for taking initially the treasure chest and the ghost shrine is rebuilt. Do good deeds, get rewards. Do bad deeds, get death. 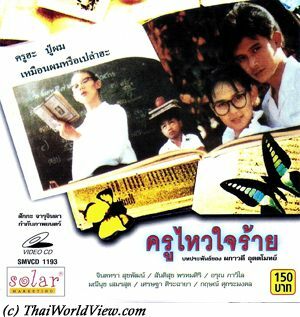 แม่นาคอาละวาด is another movie based on Mae Nak story. อาละวาด means "act violently". While her husband Mak is away, Nak is going to deliver her baby. As the movie happens on countryside, it is still the old way to deliver babies. Nak dies during childbed. Mak is in Bangkok. During the funeral ceremony, a black cat jumps on the coffin. It is a bad traditional omen. The coffin breaks and Nak opens her eyes. All villagers flee. Later on, Master Dap has arguments with Sin, son of the subdistrict headman. Master (อาจารย์) Waen is mandated by Sin to get corpse oil (น้ำมันพราย) to make magic filter (ยาเสน่ห์) to use as a weapon (อาวุธ) to fight Master Dap. The master tries to get corpse oil from Nak but she cuts his head. Mak is going back home. Nak is waiting for him. She makes delicious food for him. The food is in fact rotten (อาหารผี) with worms but Mak cannot see it. Mak realizes that Nak is a ghost as at night time her appearance changes to a putrified body. He flees from home and takes refuge at Master Dap's home but Nak is chasing after him. Nak still loves Mak and was waiting for his return since her death. Lek and her father Bukan visit Pa Khanong district. Mak previously stayed in Bukan's house. Lek is fond of Mak. She is in competition with Soi, another village lady and previous friend of Nak. A new master tries to neutralize Nak and puts her in a pot closed with a cloth covered with sacred words. The pot is thrown in the river. Meanwhile Mak marries with Lek. A couple of fishermen catch the pot and free the spirit. Nak takes revenge over Sin and the master. Mak and Nak still love each other but cannot stay together (คนละโลก). Only next life, a new love could be possible. Mak is not happy with Lek hindrance. Finally Lek is too afraid and flees to Bangkok (Bad Bangkokian people syndrome leaving the countryside people). Nak entrusts Mak with Soi. Nak leaves on her own decision. Compared to other movies, no monk or sorcerer (หมอผี) forces her to quit the earthly world. 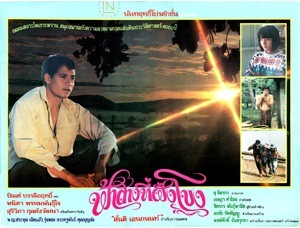 This film is a remake of previous movie แม่นาคอาละวาด shot in 1973. It is a mix of horror and comedy. 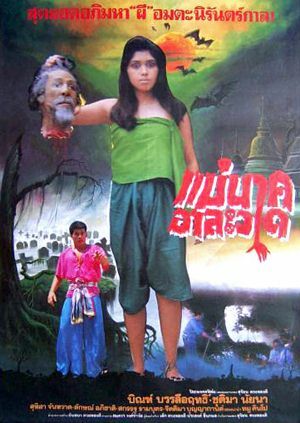 Same as many Thai horror movies from 1980s-1990s decades, it includes the classic chases when people run away from ghosts and the traditional funny characters (ตัวตลก) such as the big friend. Thieves (ผู้ร้าย) plan to rob a bank van. Pen (Sorapong Chatree) asks 40% of the gains. During the robbing, Pen is injured and left behind by his colleagues. He is captured by the police but other ruffians come back to shoot all of them to avoid leaving proofs behind. 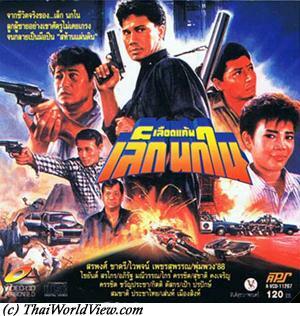 Mot (Chaiyan Sorakrai) is a policeman wishing to solve the bank robbers case. Pen flees from the hospital. 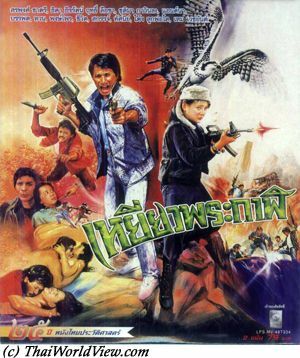 Montri (Dam Datsakorn) is the ruffians leader. Pen has fight with his former colleagues and get support from Kum, his old friend. Later on, Kum gets beaten by Montri's ruffians. Kum is ready for revenge over Montri. Pen and Mot are brothers (สายเลือดเดียวกัน) so Mot is dismissed from this case by his superior. Mot wishes to catch his own brother. Pen did such job in order to pay studies for Mot, his younger brother. Pen didn't study high so he had to do such illegal activities to get money to pay for his young brother's education. Ruffians kill Pen's father as he refuses to disclose where his son is hiding. Police head uses a policewoman to make Montri fall. It is a failure and her life is saved thanks to Pen and Mot. Mot quits police. A mysterious informer keeps giving hints to the police woman. It is Mot pushing for this case to be solved. Surat is another ruffians leader behind. Pen protects Mot from behind. Montri is looking for fake money and contacts Surat. Police, ruffians, Mot and Pen all meet during the transaction. During final shootings, Pen sacrifices his life to save Mot. Mot finally understands that his brother was a good guy. 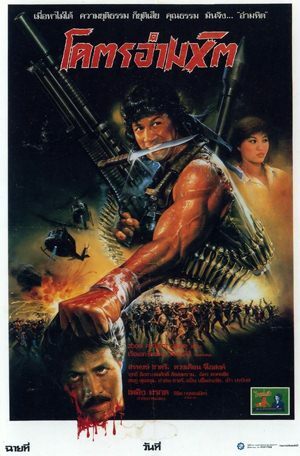 This end of decade 1980s action movie is part of movies, where Sorapong Chatree getting older has to share the leading actor role with younger actors such as Chaiyan Sorakrai. 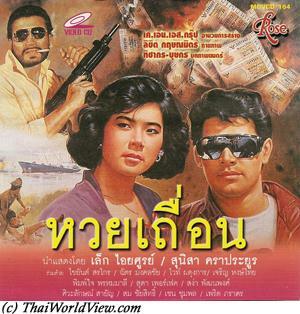 Similar to Thai movie เพชรผ่าปืน (1990), Sorapong Chatree plays the bad guy forced by life circumstances and Chaiyan Sorakrai is his younger brother wishing to stop him. Four friends at university just get their diploma. Among them, the main characters are a young lady called Na and a young man called Panit. Panit's father is a policeman. He catches people involved in drug trafficking. He disrupts drug selling gangs. His son gets university diploma (ปริญญา) but he is late to the diploma ceremony as he is always too busy. Na finds a job in a touristic hotel but Panit is still looking for a job. It is difficult to find a job nowadays. Panit meets friends involved in drug trafficking. They want him to work with them as he is worried (กลุ้มใจ) and cannot find a job. He comes back home drunk as he tried drugs. Drug dealers are freed following a procedure mistake. His friends are worried regarding Panit's new behavior. Panit shares the same flat with his father. Panit starts to take drugs (ติดยา). Panit's father is strict. There is no mother at home. The father discovers that Panit is now addicted (ทำไม). The policeman cannot understand that his son with high education can be a drug addict (ยังมีความรู้). The father forgives his son as he is also responsible of the situation by being always out of home. The policeman consults a monk. Panit continues to indulge in drugs not only joints but also heroin injections. He becomes a thug. The movie shows how drugs can change people life despite high studies if parents don't follow enough and if meet bad friends. Panit's father is suspended from the Police due to his expeditious way of working. Panit's girlfriend is raped and killed by other thugs. He takes revenge and kills accidently one thug. Meanwhile the father is reinserted in police and needs to arrest the killer (ผิดกฎหมาย). Vina is sad (เสียใจ) as her brother is dead. The thug that Panit killed is Vina's own brother! Panit is more and more addicted to drugs and has deep crisis. Vina and her friends try to help but drugs have done big ravage. Friendship (เพื่อนรัก) is still here. Panit recognises his failures (ฉันผิด) and that his father is a good man (พ่อเป็นคนดี), who follows the law (รักษากฎหมาย). Panit was his father's hope (เป็นความหวังของพ่อ). He dies when his father was going to arrest him.